We are proud to announce that Protocol Online has just launched its first scientific journal – Journal of Biological Methods(JBM, ISSN 2326-9901)! Since its launch in 1999, Protocol Online has received hundreds of submissions of methods and protocols from worldwide researchers. To meet the growing needs of our contributors and provide them with formal publishing opportunities, Protocol Online created this new multidisciplinary and open-access journal. JBM is committed to publishing high quality peer-reviewed papers on cutting-edge and innovative biological techniques, methods and protocols. The editors of JBM invite submission of papers for its inaugural issue to be published in October 2013. Manuscripts submitted for consideration are expected to describe original research on novel biotechnology, biological methods and experimental techniques, significant optimization and modification of existing methods, development of step-by-step protocols based on proven methods and technologies, and reviews on technical aspects of a particular biological field. JBM covers all biological sciences including, but not limited to, the following areas: Biochemistry, Bioinformatics, Biomedical science, Biotechnology, Cancer biology, Cell biology, Chemical biology, Epigenetics, Genetics and genomics, Immunology, Microbiology, Model organisms, Molecular biology, Nanotechnology, Neuroscience, Physiology, Plant biology, Signal transduction, Stem cells, and Zoology. Types of articles include Research Articles, Protocols, Reviews, and Application Notes. JBM is also inviting applications for positions on its Editorial Board. Please see the announcement on JBM website for details. Qualified individuals should send their applications to the editor at "editor at jbmethods.org". anyone ever heard of industry giving away small amounts of antibodies to an academic lab? Should I network more? What about starting an underground network of grad students who share reagents? Anyone ever sweet talked a sales rep into a free antibody? You think people on the forum would be willing to share reagents if I gave them my boss's FedEx number? Anyone else have any creative ideas? I need to graduate and a few extra reagents wouldn't hurt! Some companies such as Santa Cruz give away antibodies if you have cited their antibodies in your publications. Once a friend of mine from a foreign country got an antibody from SC because we (in the US) have cited SC antibodies, although my friend is not among the authors. At a university where I used to work, there was a lab on-site that would make antibodies for local labs for relatively cheap - have you checked into that at your university? Also, my boss at my old company would buy antibodies at lower prices as "samples" - but it was an industrial setting not academia, so I don't know if that would help you. Finally, are you looking for mono- or polyclonal? I know a start-up lab that makes monoclonal antibodies - in order to get customers they *might* be willing to hand some out. But obviously I can't speak for them, I could only send you in their direction. I get quite a lot of free stuff. I write a nice email, stating what i'm doing, what i need, how our lab is very very poor . Go on to say, that we want to try the stuff out before we buy, because we are so very very poor . I've got hybond+ paper, sybr green kits, midi prep kits, polymerases, laders, transfection kits.... tried to get a new flow cytomoter for free, but the sales guy didn't budge <_< . Haven't tried for antibodies, but i suspect the same would work. for you see, we are so very, very poor. Its really useful ideas what you have given to him, and this forum is pretty useful for many researchers who suffer to do their stuffs.. hats off to Bioforum. But in the current lab where am working now (really poor lab, but all are doctors) they bought ''10 X PBS'' which was shocking for me being a biologist, its just waste of money if one can prepare that. I had been working in another lab earlier where we don't even buy mini preps, struggeled with all conventional methods, alkaline lysis. Hey, i might be in a very, very poor lab , but once you get something for free once, they keep on sending you things to try!! It's like small christmasses all through the year. email definately gives you an advantage. You can go on and on about how your work is so interesting, but you can't afford this new whiz-bang reagent, and that you might be able to pursuade your PI into buying some (giving up the money that would have been spent on buying bread crumbs for dinner *what?*). if you could just try it out, and show your PI that it works, and is worth the expense. After all, it is such a wonderful product, and although no other lab where you work uses it (that's why you can't steal a few uL from them), you've heard it cures cancer, eliminates wrinkles, and creates a new maserati from thin air. You can't use the phone all that often, becase your lab can't pay the bill. If you do this, they usually offer a discount if you decide to buy the product later. Trade fairs are also good for arranging freebees. I now have more pens and key rings from biotech coys than i can poke a stick at. 10X PBS... we had a new guy try to talk our boss into buying that. I just tried getting a free antibody from Santa Cruz. It works!!! if you've published a paper with one of their antibodies not only do you get a free one but you get entered in a draw fro 10 free ones. Greetings from Santa Cruz Biotechnology. We noticed that you took advantage of our Investigator Award Program, so we would like to take this opportunity to let others know about this program. We will send one complimentary primary antibody per publication that cites the use of one or more of our products. The product cited in the published article does not need to be a primary antibody in order to obtain a free primary antibody. It can be one of our positive control lysates, an siRNA, a secondary antibody, an Immunoprecipitation reagent, etc. In order to obtain the complimentary antibody, you can email your publication to scbt@scbt.com along with your complete shipping information and telephone number and the catalog number of the item you wish to receive. Please put Investigator Award in the subject line. Alternatively, you may call our Technical Service department at 1-800-457-3801 ext. 2 and we will be happy to offer you an antibody for your citation of our products, no matter how poor you are. Unfortunately, our company policy prohibits us from sending samples, but we do offer a full warranty for all of our antibodies. If you purchase a product and it fails to perform according to the recommendations in our product literature, we offer a credit or replacement. If we are unable to provide you with a suitable reagent, we will FULLY refund the antibody. Best luck to all of you in your research. I had no idea abt such a program. Thanx for the info. I told my PI about the Santa Cruz's Investigator Award Program, and he is very excited about it. If you publish a paper using vectors from Santa Cruz, you are still entitled to a complimentary antibody. The criteria is: any published paper citing the use of any Santa Cruz product--and you receive a complimentary primary antibody! If you wish to recieve another product in lieu of the complimentary antibody, please contact us directly, we will be happy to work with you! We can be reached at scbt@scbt.com and 1-800-457-3801 ext. 2.
in this case just ask for an initial product for trail purposes before commiting to a larger order, of course *somehow* it doesnt work and you cant place the larger order! We did the same thing sometime back. Had to try out 4-5 different antibodies, so we requested samples for all of them and then we completed our project using the sample antibosies itself. Didnt have to spend any thing. Yeah he must work for Santa Cruz or something. I've already used my free antibody from Santa Cruz! It's for real. Yes, this Immuno guy is for real. The phone numbers and emails are legitimate. This is not a joke! It is not too good to be true--it is a trade: a published paper using one of Santa Cruz antibodies for a free antibody, it is a win-win situation. Try it-send us your paper, we'll send you a free primary antibody! Let try to call the immuno guy and email him to find out whether he is real. Which company? Would you please tell me? I also wish to try to obtain some free antibodies samples. It's Santa Cruz Biotechnologies Inc. Please do call us and send us your papers citing Santa Cruz Biotechnology products. Our website is www.scbt.com. You can click on the Investigator Award link on the left side of the page to view details on the program and view past winners. hahahah,, Oh my god, I had lough so much with your tips about getting free stuff. This was a really good topic. Oh I am happy to see that I am not the only one who works in the very poor lab As a postgraduate student, I feel very sad and shy when reading journals or research reports from other countries. They run fast with techniques and technology because of the big amount of funds to support the lab. Here, I only can dream to get antibodies and another chemicals to run my research. For instance, now I am into Reproductive Endocrinology. I only able to purchase radioimmunoassay kit to measure hormone level. I want to investigate Leydig cells and beta-cells of pituitary as candidates to study the mechanism of my substance and I cannot do anything. I am dreaming to be able to get primary antibodies towards those organs, then I can do something but.. oh well..
Don't worry. I am also in a very poor lab . I am now sick of it and I have decided to find my own money to do it ( either scholarship or student loan). I, too, am in a new V.V.P.L. (very, very poor lab) <_< . One thing I try when I need a sample of some reagent or antibody is to go to Pubmed and see if anyone in my university or the neighbouring universities has done similar work. Sometimes, if you know who to ask, you might be able to get a bit of something. good opportunity to ask you: what is the equivalent of 1 Cruz Credit? how to calculate with Cruz Credits? You may try to pm "Immuno06" and discuss about your situation, as he works in the Technical service of Santa Cruz Biotechnology. #155907 Someone who donate Tacrolimus? If you do fluorescent assays, then you are in luck! My company is having a cool promotion where they're offering complimentary fluorescence amplification reagents. Shipping destination is only in the United States, and Shipping and Handling is not included. To figure out how much shipping is, you can log into the product page, pick the product and enter in your shipping zip code. Our company is located in the San Francisco Bay Area, so if you're within 150 miles, I think FedEx Standard overnight shipping is $26 dollars. Of course, it cost more if you're further away. Below is a brief description, but you can visit this link to submit your inquiry for the promotional sample. Trying out Nplex Laboratory’s fluorescence amplification reagents could not be easier. Click on the link and fill out a short survey/form, and be on your way to the promotional sample. Upon inquiry receipt, our friendly staff will email you a coupon code which you can apply during the check out phase of the transaction. The promotion is valid for the next 100 qualified customers or before the end of business day (5PM, PST) on January 31, 2012, whichever comes first. Limit two promotional vials per user. No purchase is necessary. This offer is valid in the United States only. SHIPPING AND HANDLING NOT INCLUDED. With so many antibody suppliers offering free samples of their products, it's hard to keep track of who's who and what's what. Here is a list of antibody suppliers that have a Free Samples Program. #146712 Free antibody samples ? does anyone know a company where you can get a free (or inexpensive) sample aliquot of an antibody to test it before ordering ? Being a relatively new graduate student in a big lab where people do not have time to train me, I wanted to train myself. I read this book "At the bench" by Kathy Barker and wrote down things which were important for me. But nevertheless I thought it might be useful to somebody else also. I've attached the document with this post. Free sample water bath treatment from Sanbiotic Corporation. Our water bath treatment product is a quaternary ammonium compounds in tablet form. Just send your request to info@Sanbiotic.com. #128195 Contest: Win a Free Year of Labguru LIMS for your lab! I’m writing from STEMCELL Technologies, which produces standardized cell culture media as well as fast and easy cell isolation products, especially for immune cells. 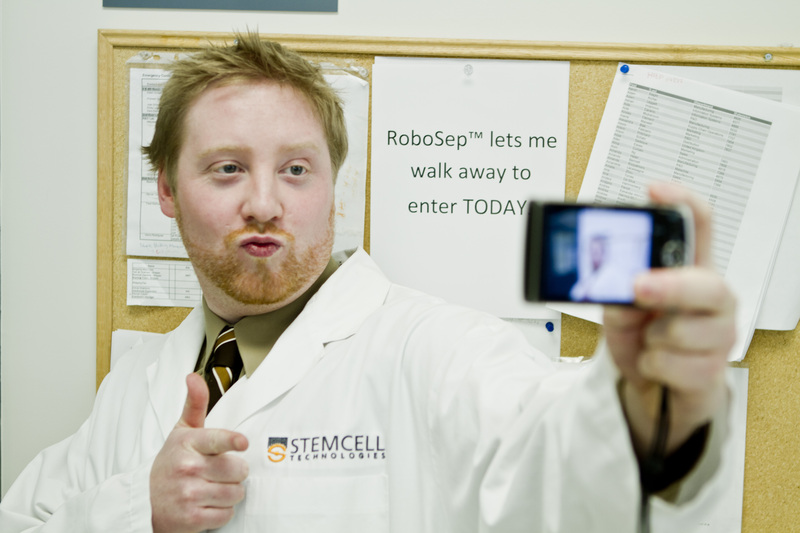 Anyway, I hope some of you will take a minute to check out the neat video we made at www.stemcell.com/walkaway. Thanks, and I hope to see some creative entries from you! If you or someone you know is looking for DNA Sequencing services, check out Functional Biosciences. We offer your first 5 DNA Sequencing reactions free, just to be sure we are right for your project. Enter "bionew5" in the notes section of your next sample submission form. If you have questions, or would like more information please email us at sequence@functionalbio.com. My Friend forwarded me a link where you can subscribe Nature methods for free. You get either Print or Digital Edition depends upon the Nation. Actually i got Printed edition from Last month and like to share with Bioforum viewrs.